"At the age of 43 in 2009 I graduated with a MFA from the Rainier Writers Workshop at Pacific Lutheran University in Tacoma, WA. It had long been a dream of mine to attend grad school and truly focus my life on poetry. I had been a fan of Copper Canyon Press for many years and as part of my 'Outside Experience' required program component I was lucky enough to acquire an internship with them. I then worked for CCP for another year in fundraising. So CCP is close to my heart in many ways. 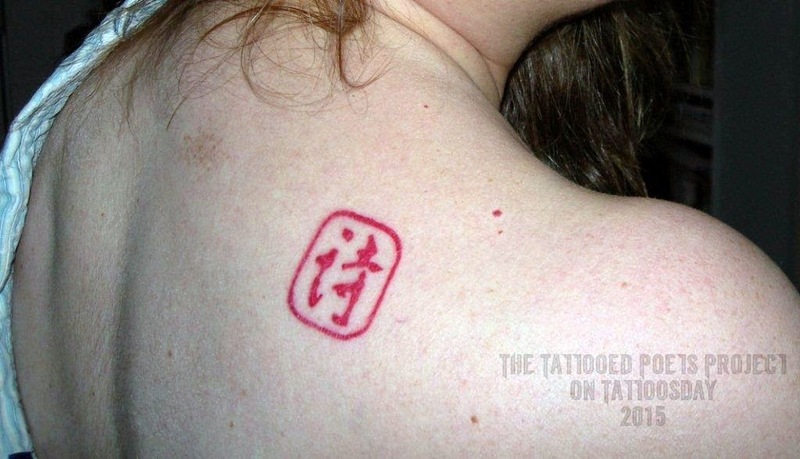 When I learned that the Chinese characters prevalent on all their books was the Chinese translation for poetry (literally 'Word Temple') I knew that tattoo would be the gift I gave myself upon graduation. A kind of reminder to myself of the power of poetry and the central role I wanted it to take in my life. Four of my cohorts and now life-long friends came with me on that day and also got tattoos. This was my second tattoo. The shop where we got the tattoos is now gone, but the memory and tattoo live on." milk and a chicken crouched in the freezer. as the remnants scattered in their wake. the little soul encapsulated in her little hut. and then, house and street, portrait and memory. time from the stillness of relics. Thanks to Tina for sharing her tattoo with us here on the Tattooed Poets Project on Tattoosday!